In recent years a wonderful array of tropical, subtropical, and tender perennial plants have become more widely available to gardeners. These may be marketed as summer annuals for in-ground beds or for patio containers, and include plants noteworthy for showy foliage, as well as exotic bloom. Most flourish in regions that receive hot, humid weather in summer, and many flower from early summer until frost. Few plants attract more pollinators than the bloodflower. 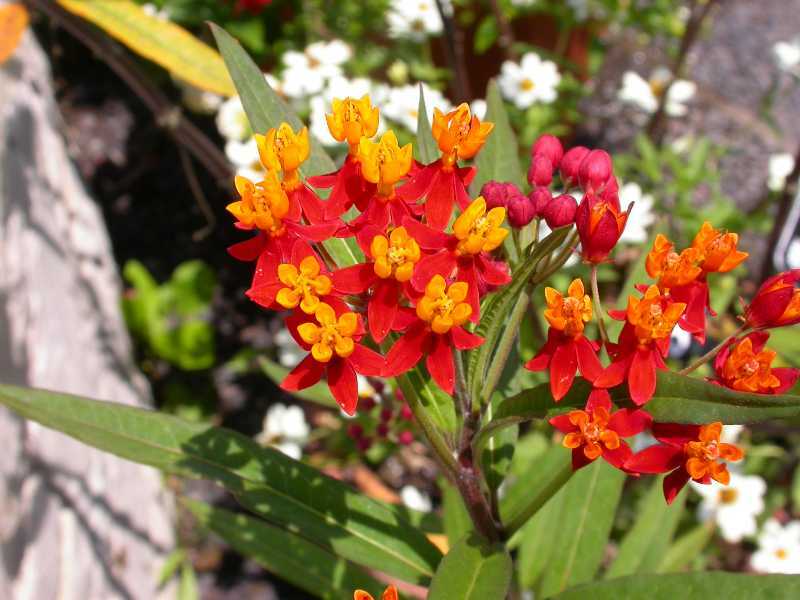 Its showy red and orange flowers are visited by butterflies, bees, and hummingbirds. A pure yellow form is equally attractive. The leaves of this tropical member of the milkweed family serve as a food source for the caterpillars of the Monarch butterfly. Effective when massed in borders, it also thrives in containers with well-drained soil. Water: Average moisture, tolerates the occasional dry spell. 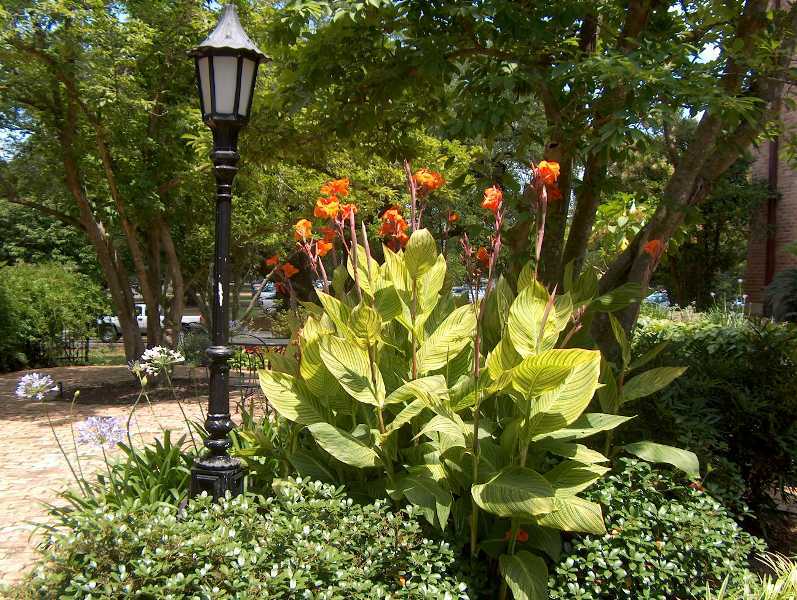 This tree-like subtropical shrub is suitable for in-ground culture or containers. 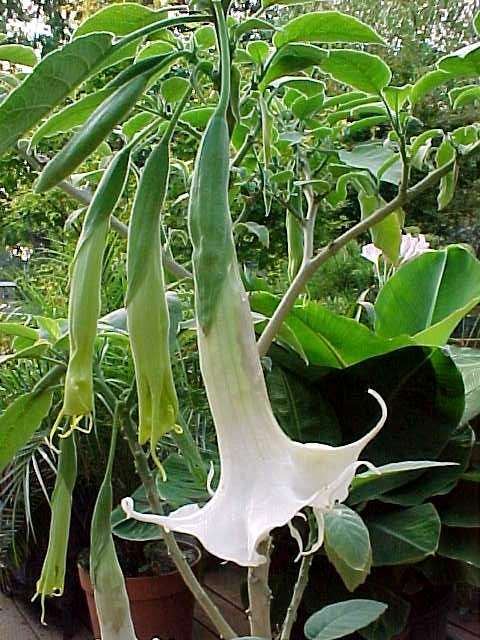 Their show stopping pendulous, trumpet-shaped fragrant flowers begin to open at dusk and perfume the nighttime air. Flowers are borne in 4 to 6 week cycles, often peaking close to a full moon. Flowers may be white, yellow, pink, orange or gold, depending on cultivar. Grow in full sun in rich, moist well-drained soil, providing ample water and regular fertilizer for best performance. Height and spread may exceed 5 to 6 feet. Control size by pruning. Easily overwintered in a dormant state. NOTE: All parts of this plant are poisonous. Modern cannas have it all. Their large, paddle-shaped leaves vary in color and variegation from cultivar to cultivar. Many have showy flowers in a variety of colors, and all have a commanding presence in the garden or containers. Many cultivars exist, including short, medium and tall types. Rarely bothered by pests, though Japanese beetles may feed on the foliage of some varieties. Dig the bulbs before the first hard freeze in fall and store the bulbs in a cool, dry place for winter. Some older varieties may survive local winters when placed in a sheltered location or if their roots are protected with a covering of mulch. 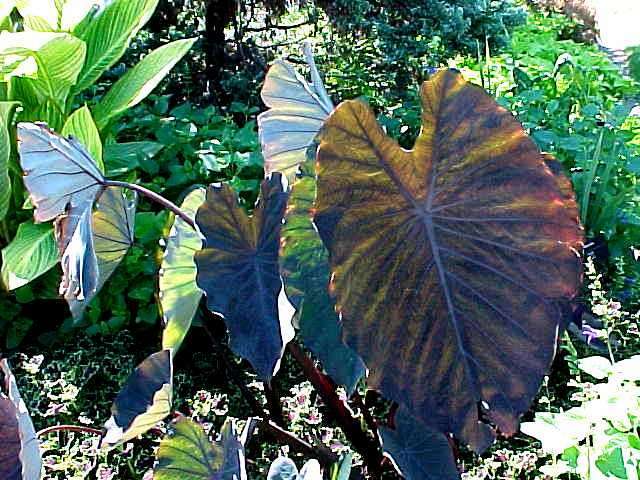 The huge, heart-shaped leaves of elephant ears have been a quintessential element since Victorian times, and no tropical garden should be without them. Once only available in plain green, in recent years the market has been flooded with outstanding cultivars bearing leaf coloration of chocolate and black, and variegations of purple, black and yellow tones. Equally at home in the garden or containers. Sun: Full sun for maximum size. Most cultivars tolerate moderate shade. 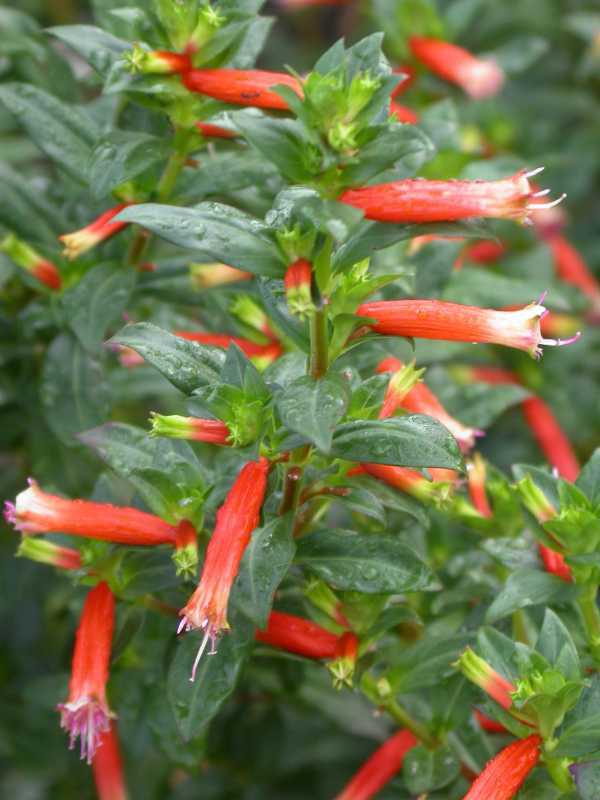 Of uncertain parentage, the hybrid Cuphea ‘David Verity is one of the best bedding plants for attracting hummingbirds to the garden. Bearing inch-long, orange and red tubular flowers, few other plants produce the sheer quantity of blooms. Flowering all summer until frost, it can be grown in the border or in containers, provided it has well-drained soil. Potted plants may be over wintered on a cool, sunny windowsill. Water: Evenly moist, but tolerates occasional dry spells. Grow this plant for its outstanding foliage effect and graceful texture. 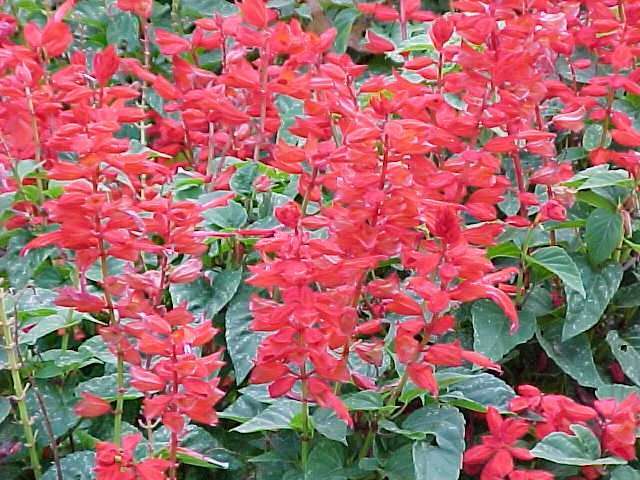 It is a must-have plant for lovers of red and purple leaves. 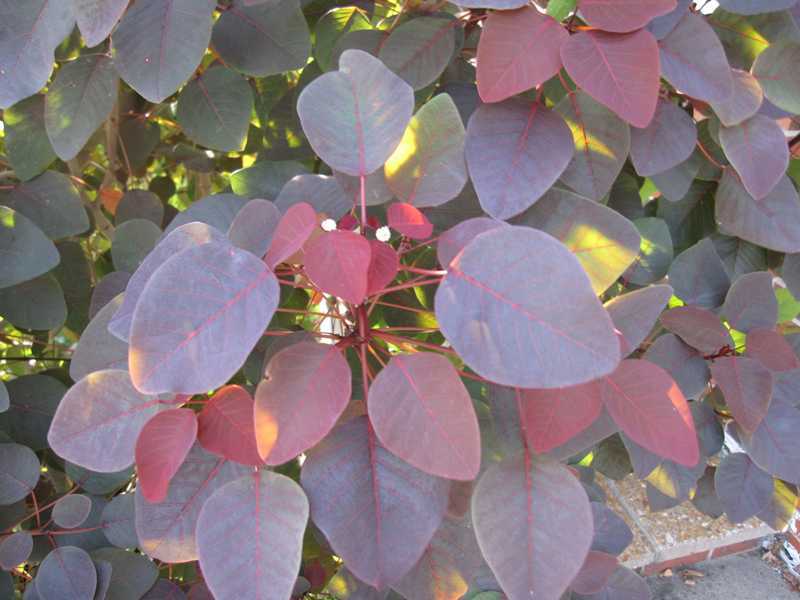 Its coppery-red leaves bear a resemblance to dark-leaved forms of the hardy smoketree, Cotinus coggrygria, hence its species name. Equally showy in beds or containers. Insignificant white flowers are produced in late summer. Prune the lower shoots and branches of young plants to develop a single trunk form. Can be overwintered in a dormant state in a cool basement. NOTE: All parts of this plant contain a milky sap that may cause a rash. Water: Evenly moist. Tolerates occasional dry spells. 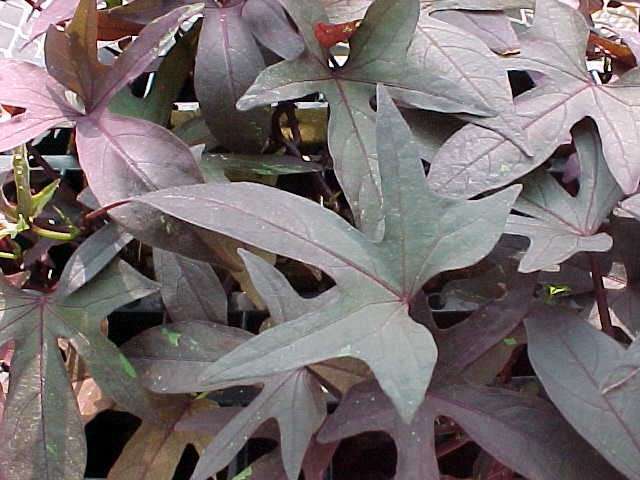 The bold leaf colors of ornamental sweet potato vines serve a dual purpose in tropical-style gardens. They can hold forth as feature plants in their own right, but can also serve as the perfect complimentary foil for other specimens. Rapid growers that send out many stems, they can quickly cover bare soil while serving as a decorative living mulch, drape down from a container or window box, or climb up a standing structure with just a little training from the gardener. Some varieties produce large tubers that, while edible are not especially tasty. Just the same, these can be stored over winter to provide many starts for next summers garden. Sun: Full sun for best color, but tolerates light shade. Height: Prostrate ground cover up to 1 foot tall. 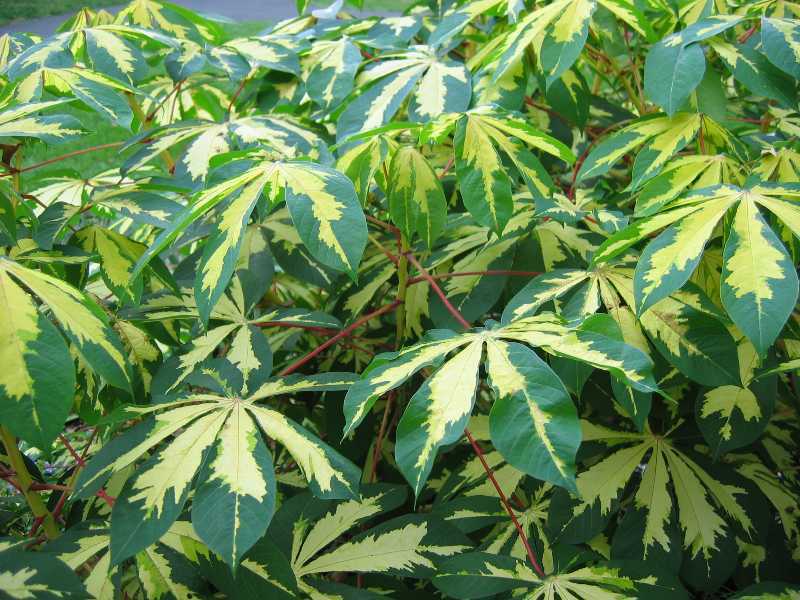 Large, deeply lobed yellow and green variegated leaves held aloft by red petioles make this plant a striking focal point in the garden. At its best as temperatures rise, it thrives in the heat and humidity of our typical summer weather. Easy to grow when placed in a deep, moist soil enriched with organic matter, it has the added attraction of being virtually insect and disease-free, and is also first-class for container culture. Water: Loves moisture. Hard to overwater as long as soils drain well. 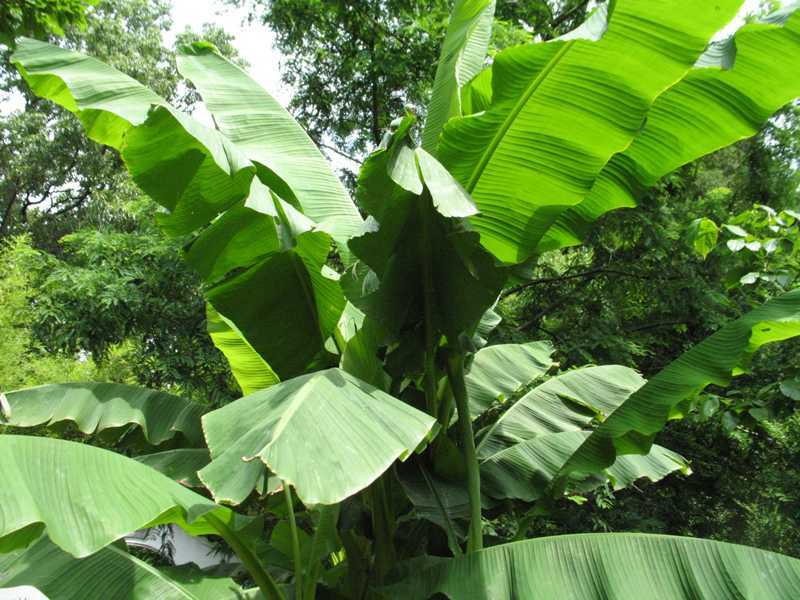 Along with cannas and elephant ears, no other plant says “tropical” more than bananas. They are fast-growing, with the most vigorous varieties putting on anywhere from 6 to 10 feet or more growth in a single season. Depending on variety, their huge leaves come in many interesting colors and variegated patterns. Though they are thought of as trees, they don’t produce woody growth. Their leaf sheaths form a trunk-like structure called a pseudostem which arises from an underground rhizome. Bananas can be grown in the ground, or in large pots and are easy to overwinter. If their stems are not cut back, new growth will resume at the point where growth stopped the previous year, and the resulting plant will achieve massive stature. Water: Provide abundant moisture and fertilizer for most vigorous growth. Height: Dwarf varieties not withstanding, most cultivars grow 6 to 14 feet or more. Several cultivars exist. S. ‘Faye Chapell’ is an outstanding form. This profuse bloomer is covered with crimson flowers from June until frost. Hummingbirds and butterflies find it an irresistible magnet. Equally productive in the ground or in pots. Provide full sun or partial shade with a rich, well-drained soil. Grows 3 to 4 feet in height and spread by late summer.